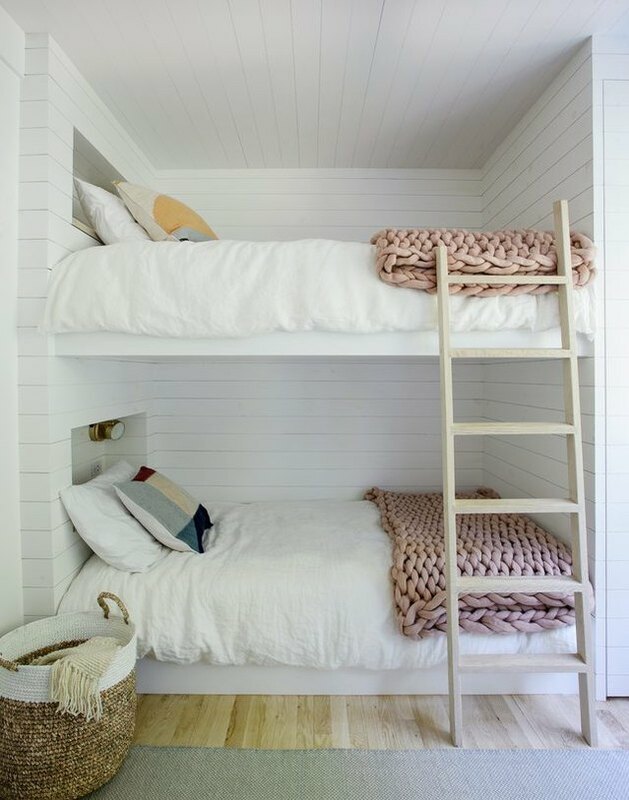 When you think of "bunk beds," chances are you're fondly recalling slumber parties, overnights at camp, or sharing a room with your sibling. Some memories might be fun — calling the top bunk and giggling with your roommate long into the night — while others, you'd be happy to forget — squeaky bed frames and rolling off of the top bunk. Luckily, these beds have come a long way since your childhood. Today's options are modern, sleek, and surprisingly stylish, especially when they're presented in an equally-chic space. 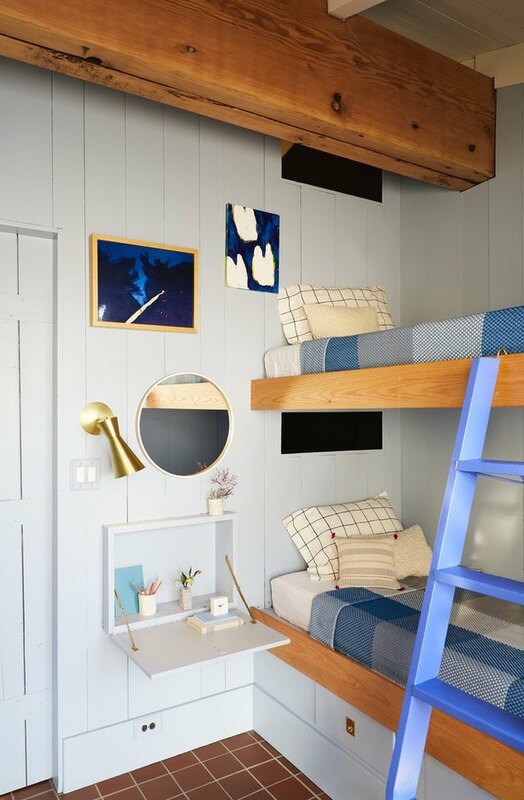 While a bunk room is of course a great option for little ones, they're also cozy hideaways for reading or napping and perfect for putting up houseguests. 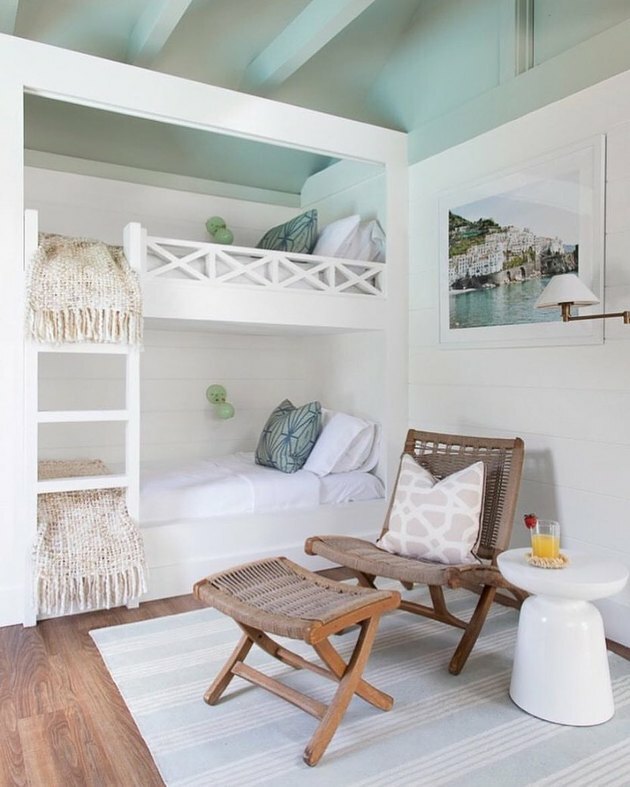 Here are 19 impeccably designed bunk beds that are not only super-comfy and dreamy, but they also mesh well with their surrounding decor. 1. Integrate texture and boho accents. 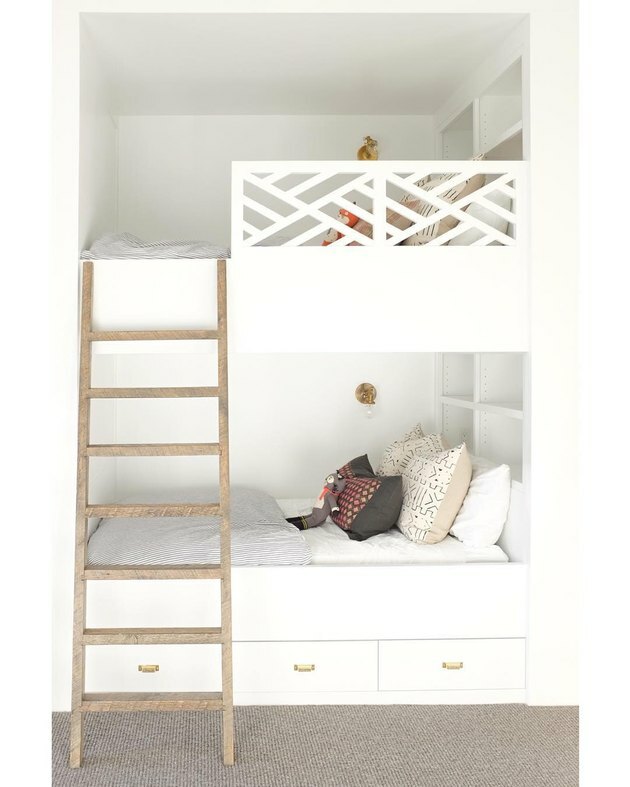 This bunk room designed by Becki Owens is kid-friendly and all grown-up in equal parts. There are sweet little touches, like the elephant on the dresser, but the boho-chic details — tribal rug, faux sheepskin throw, plants, and natural wood finishes — keep it airy and modern. 2. Get moody with darker hues. 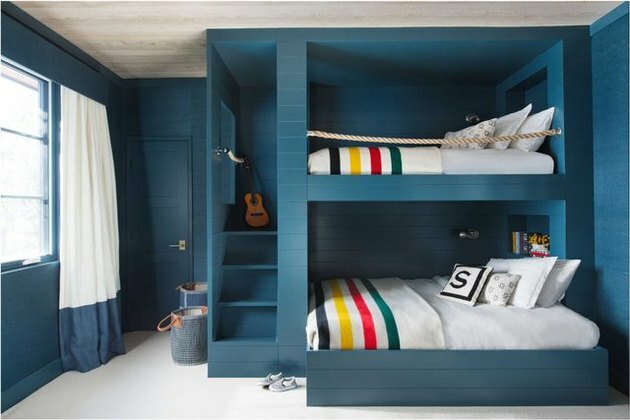 A strong color palette can anchor a bunk room, like this space designed by Jenny Keenan. 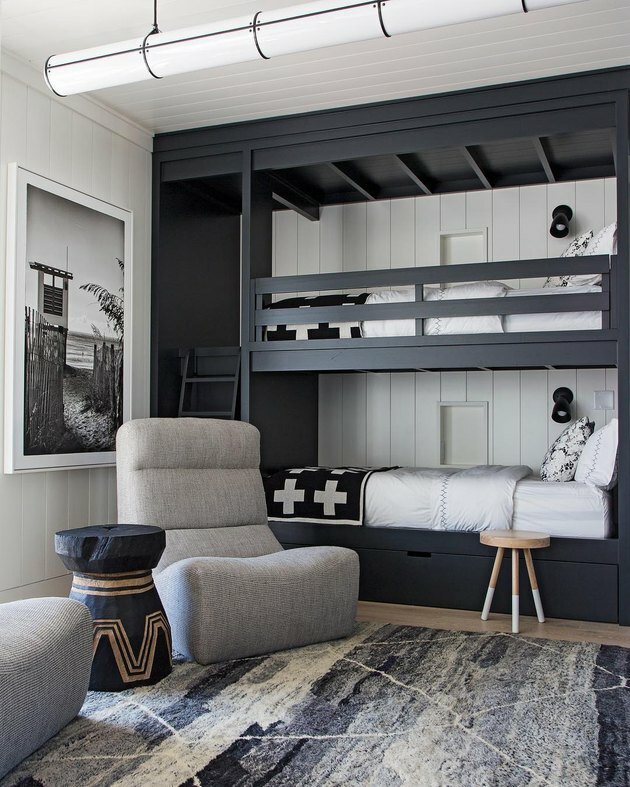 The blue-gray bunks pair nicely with complementary hues throughout, like the white and black throw blankets, black side table, and area rug that ties it all together. The other side of the spectrum is a bedroom that's bright and breezy. This space designed by Amber Lewis pays homage to chill California vibes using light wood, white walls, and modern decor to create a laid-back look. 4. Sprinkle pops of black throughout. 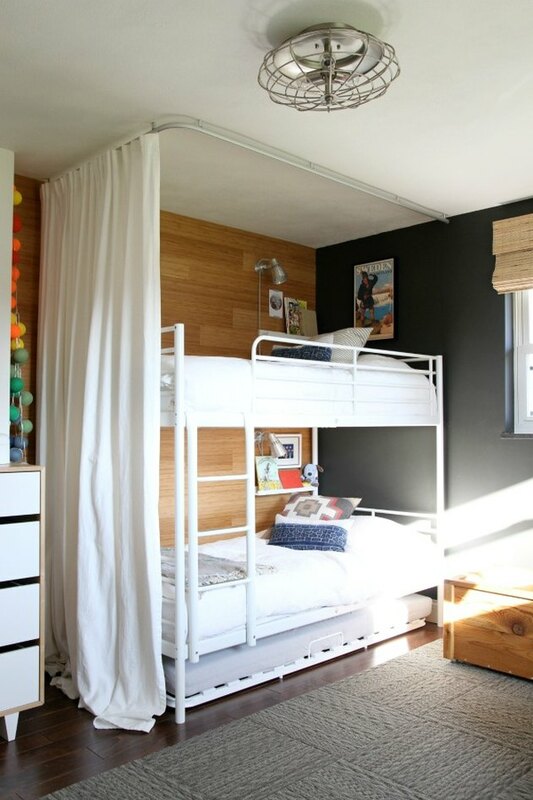 Carefully chosen black accents punctuate this Scandinavian bunk room. We love the way the ebony ladder, wire frame stool, and wall art create a bit more drama in the space. 5. Try a creative room layout. 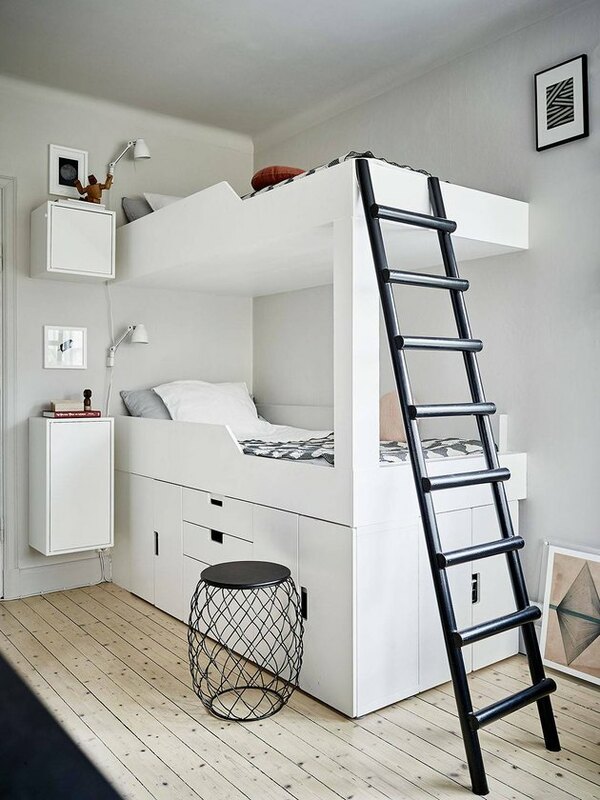 When it comes to a bunk room's layout, think outside of the box. This galley-style space designed by Cortney Bishop holds not only four beds, but a couple of snug window seats as well. 6. Don't forget to make it playful. 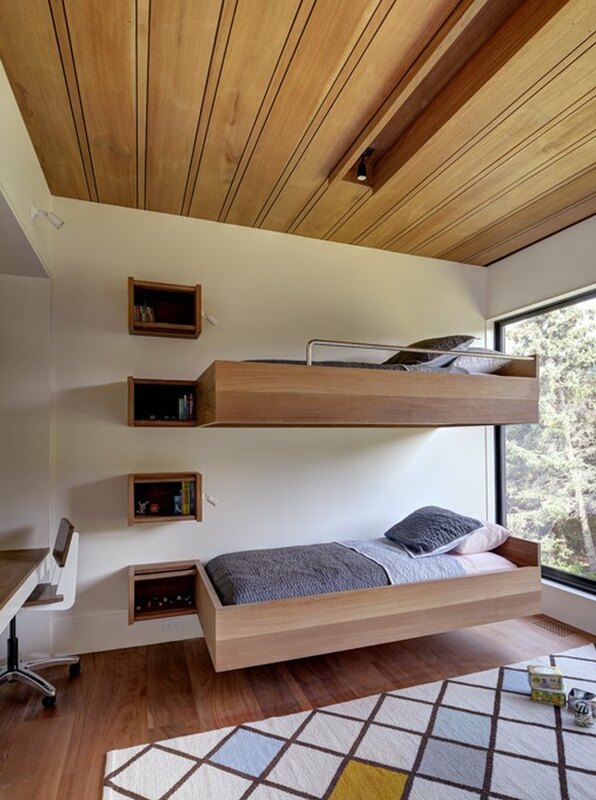 Bunk beds are naturally playful. So keep things light with whimsical patterns and board games at the ready, like this room designed by BHDM Design. 7. Opt for all white. 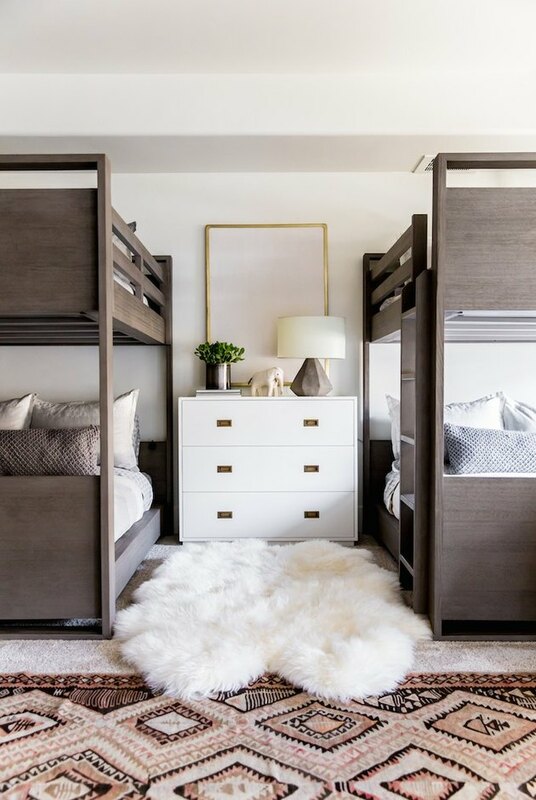 This bedroom is so fresh, and so clean, thanks to painted white bunks, a subtly-hued ladder, and neutral throw pillows, all pulled together by interior designer Nicole Davis. Shiplap has seen a surge in popularity thanks in large part to Joanna Gaines' signature farmhouse style. And in this Scandinavian beach house designed by Jessica Helgerson, the country detail is an ideal finishing touch. 9. Add industrial flair with metal pipes. 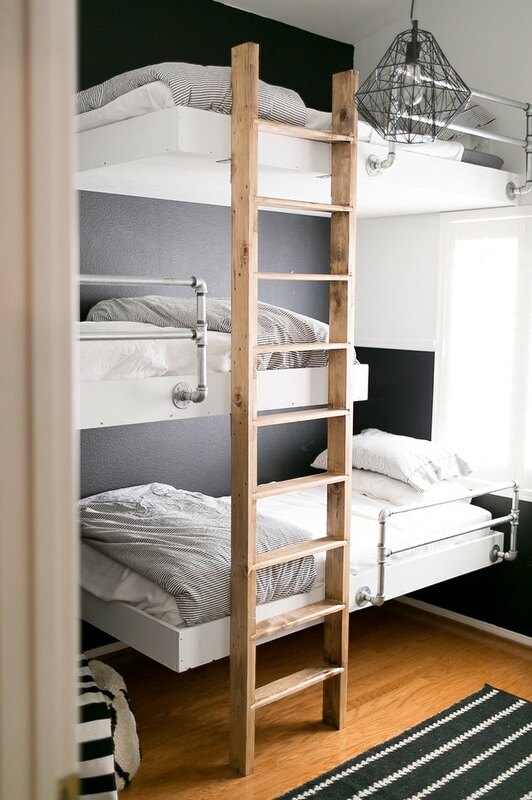 Add industrial flair to your bedroom by installing metal pipe guardrails around each bunk. They offer protection to little ones who might be prone to rolling out of bed in the night, and they definitely increase the cool factor, which is exactly what Jodi from J. Anne Photography did in her boys' room. 10. Create cozy, beach-chic vibes. Just because a bunk room resides in a beach house doesn't mean that it can't embrace some hygge elements, too. The coastal vibe in this room designed by Christina Kim is achieved with wall art, turquoise pillows, and wicker furniture. And to warm things up on chilly nights, add in a few throw blankets and plush linens. 11. Purchase modern light fixtures. In the mood for some late night reading? 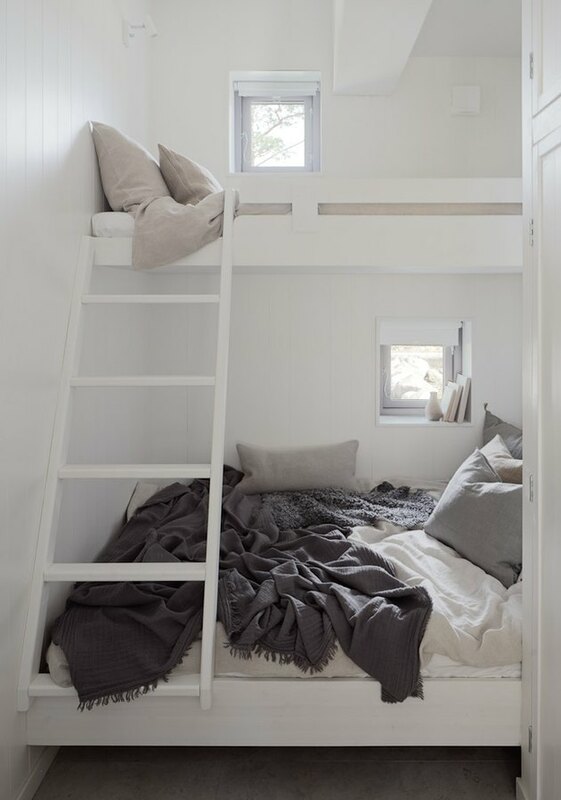 If so, a bunk outfitted with good lighting makes the perfect nook. These built-in beds, designed by Becki Owens, each have their own practical, yet modern, adjustable wall sconce. 12. Invest in warm and cozy bedding. 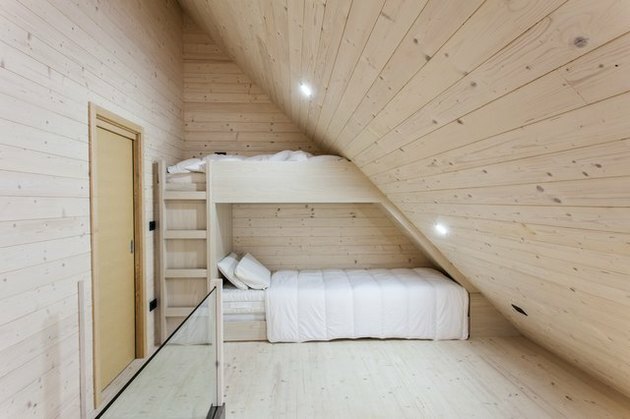 This bunk room, designed by Swedish architecture firm M.Arkitektur, is an amazing spot to dream the afternoon away. The pillows and blankets lend a soft look to the bunks, and there are small windows in case you want a reminder of the outside world. If you're going for a country vibe, be sure to bring in plenty of natural wood like this Slovenian retreat. The architecture firm Pikaplus brought the outdoors in by decking out the entire minimalist interior with soft wood. 14. Embrace modern farmhouse style. To create a farmhouse bunk room like the one in this Hudson Valley home designed by GRT Architects, you'll need these must-haves: classic plaids, exposed ceiling beams, a neutral palette, and of course, an shiplap walls. 15. Don’t shy away from color. 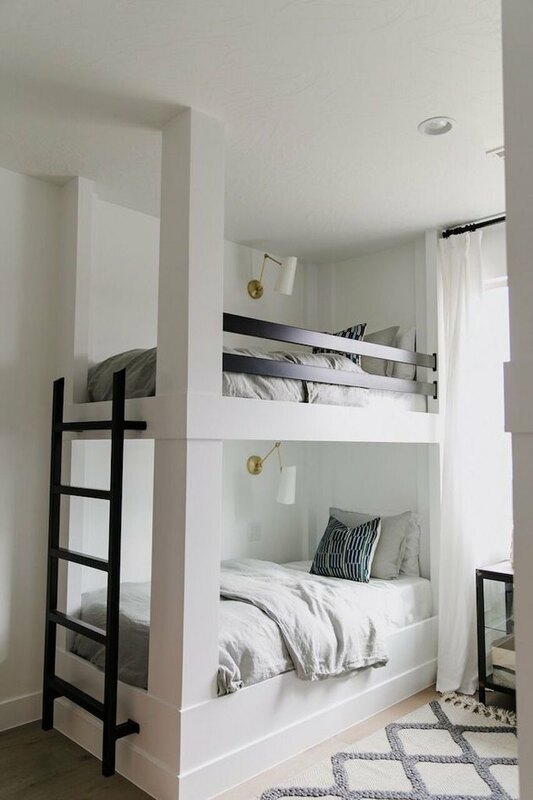 You can't help but smile when looking at this fun bunk room created by Dana from House Tweaking. She brought in color with vibrant wall art, eclectic throw pillows, a black accent wall, and a nearby rainbow garland. 16. Match wood finishes throughout the room. This bunk room is a midcentury masterpiece, with its retro area rug, wood-paneled ceiling, and bunks that echo that same light-colored wood finish. Bates Masi Architects designed this throwback that manages to look oh-so-current. 17. Consider a minimalist approach. A bunk room doesn't need a lot of bells and whistles — it needs a place to sleep with some stylish accents thrown in for good measure. This minimal yet, eye-catching bedroom designed by Liza Reyes does just that with shiplap walls, black accents, and striped bedding. 18. Punch things up with bold patterns. 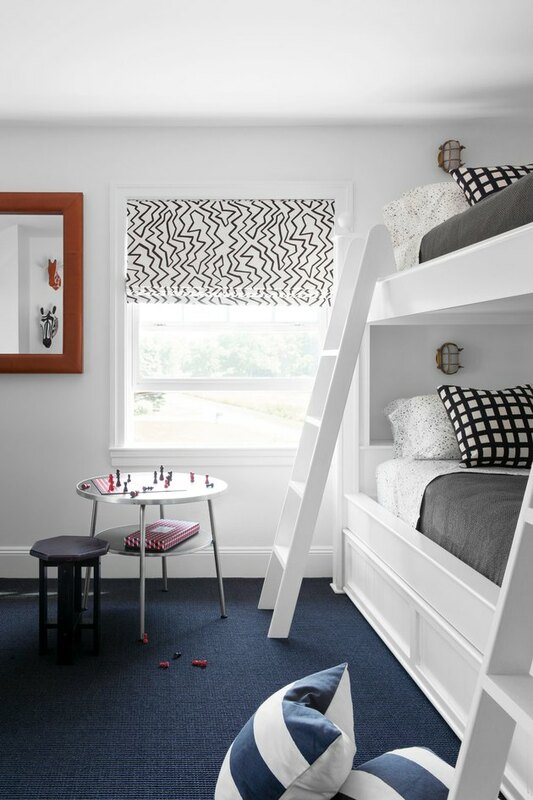 You can make a bunk room your own with the bold patterns and bright colors of your choosing. Interior designer Jenny Keenan brought daring oranges and graphic patterns into this boys bedroom to create a fun space for them to call their own. Don't shy away from implementing a theme in your bunk room, especially if it's meant for kids. This blue bedroom designed by Shannon Wollack, is both fanciful and down-to-earth with its crisp nautical details.